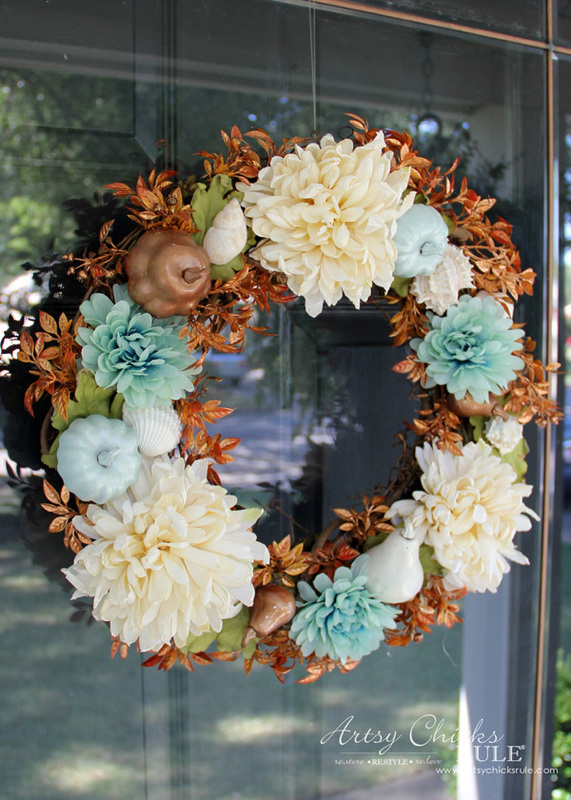 Who says you can’t use blue and seashells for fall? 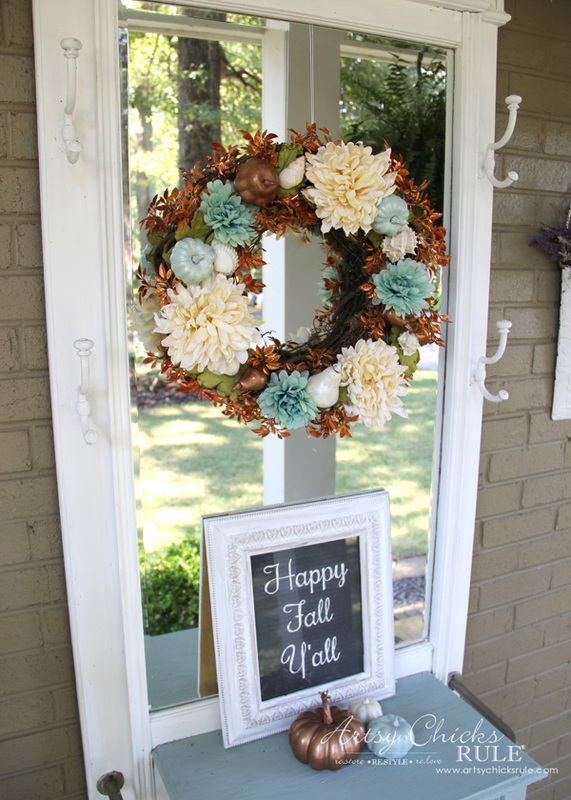 This simple and quick coastal fall wreath is perfect for those who live at the beach or just want to keep a little summer in their decor. I’m really just loving the more neutral colors I’ve been using the last year or so for fall. I know others may love it and that’s totally okay, it’s just not my thing. I do like a bit of it in my decor though because it just says “fall”. 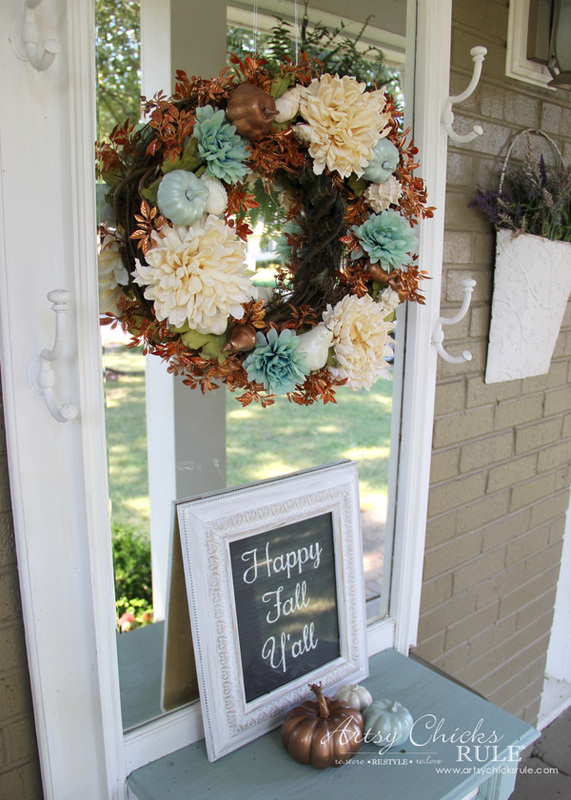 I’m going to share with y’all how I made this really simple Coastal Fall Wreath…in no time! I stopped by Michael’s and picked up all the supplies. Every single one came from there. 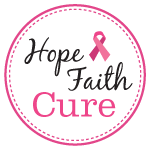 Here’s what I started with….. 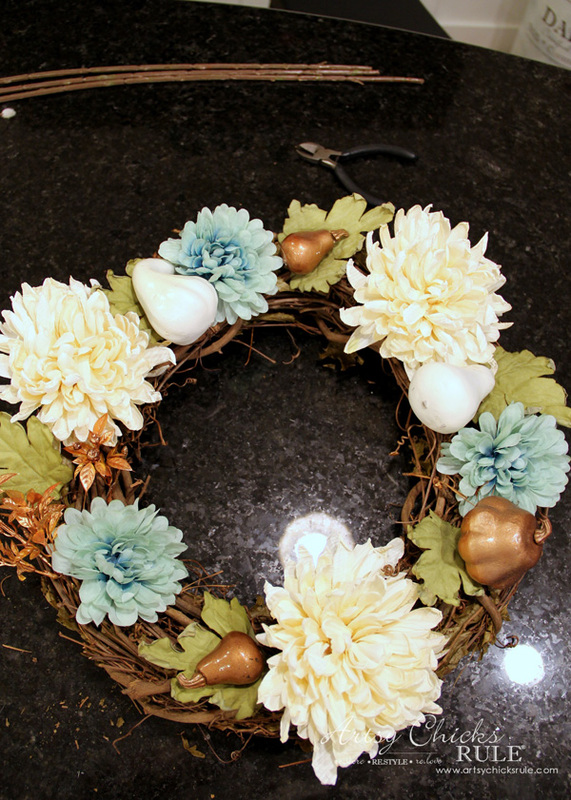 I usually like to create most of the wreath before hot gluing it. That way, I can get a feel for what I’m going to do. I just buy things that I think look good together, color wise and plant wise. Then I come home and just start playing around with it. 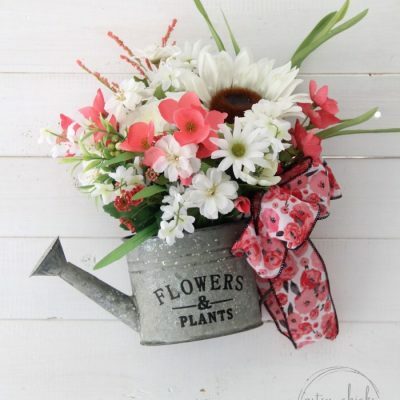 For this one, I started with the largest flowers (stems cut)…. …placing them evenly spaced around the wreath. Next I added the blue ones…. ….again trying to evenly space them around. 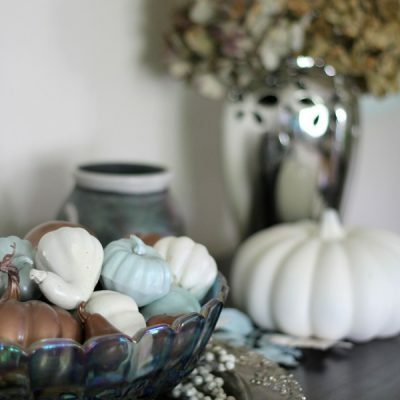 ….and some of the small pumpkins I painted for last year’s fall decor. 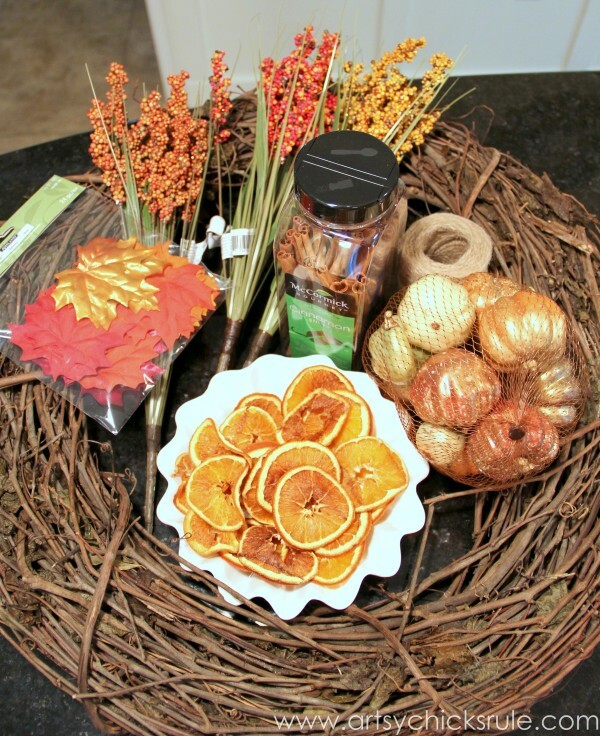 Here you can see my >>> Fall Foyer and >>> Fall Tablescape. 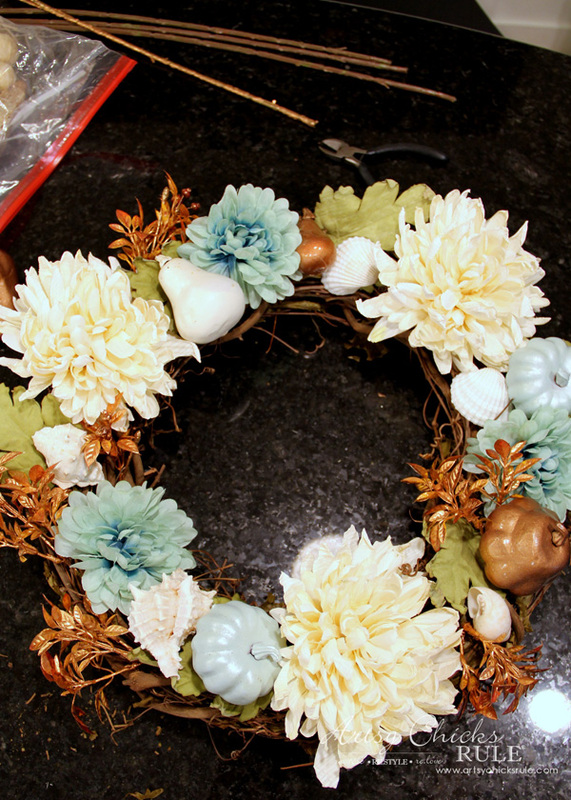 Next I added a few seashells and started adding the copper colored pieces in and around everything. At this point I had everything about how I wanted it so it was time to glue it in place. I gently removed and replaced (with hot glue) everything, working my way around. I continued to add the copper colored pieces until I thought it was full enough. And voila!! …. 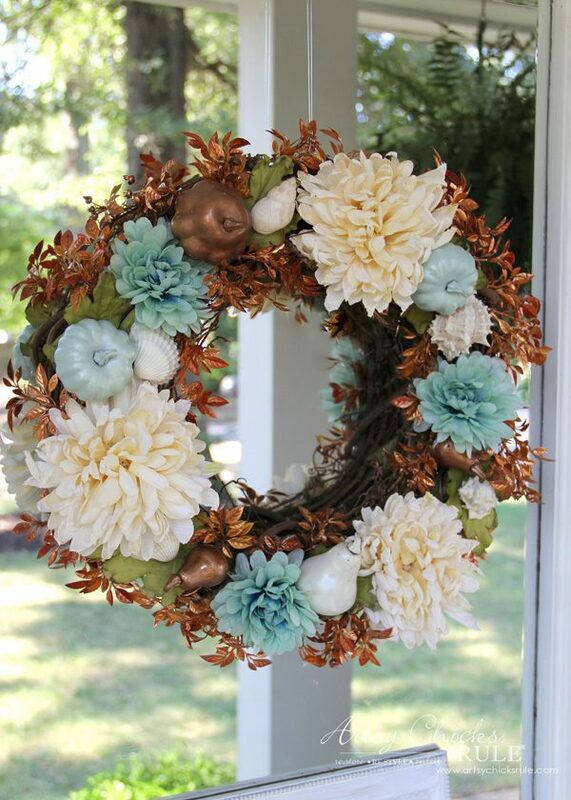 new coastal fall wreath. About as simple as they come. I love that I can have those neutral colors I love (cream, white and BLUE!) and still have a bit of copper colored FALL. I hung it on the door for a bit…. ….but then decided it needed to go on my hall tree that’s still out on my porch. 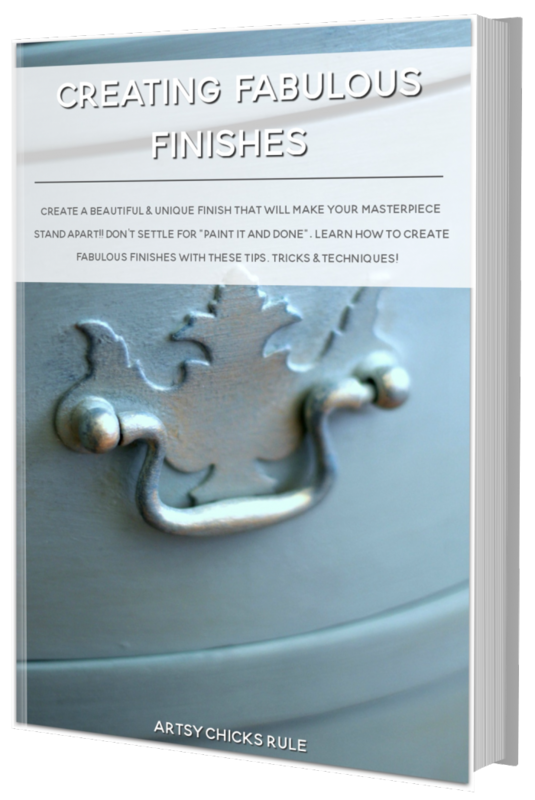 Did I tell you that I’m getting ready to paint my front door? Teal…aqua…blue…something a bit pale in one of those varieties. I’m so ready to paint away the black. Anyway, you can read about why I have a hall tree on my porch here >>> Porch Hall Tree. I added some more of my painted pumpkins below too. 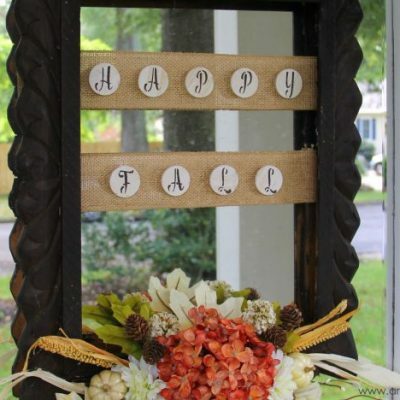 The sign can be found here >>> Happy Fall Y’all Chalkboard Art. 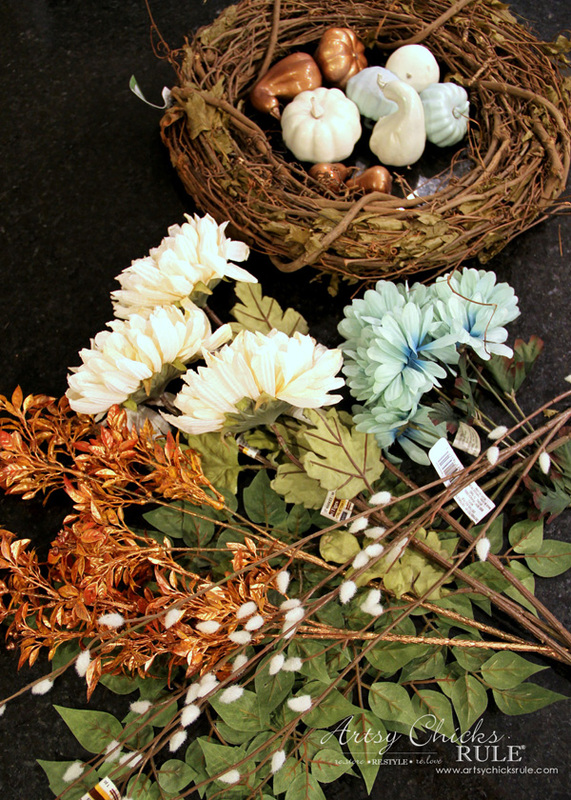 I hope you guys will stop in at your local craft store, pick up a few things you like together, and make a wreath too! 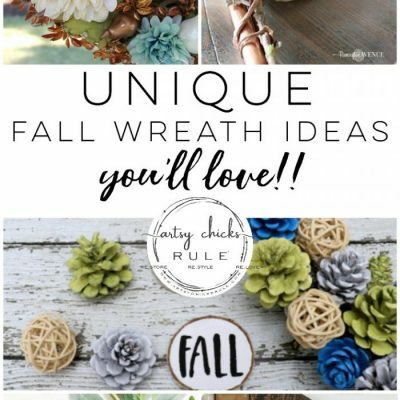 Be sure to PIN this for later so you can make a coastal fall wreath or any kind of wreath you like too! 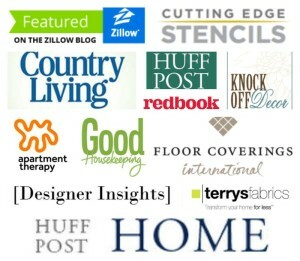 Love more traditional colors? 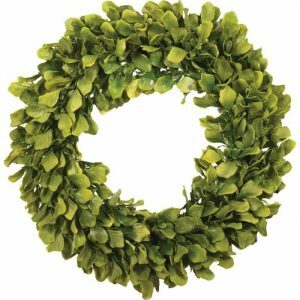 You might like this wreath below…. 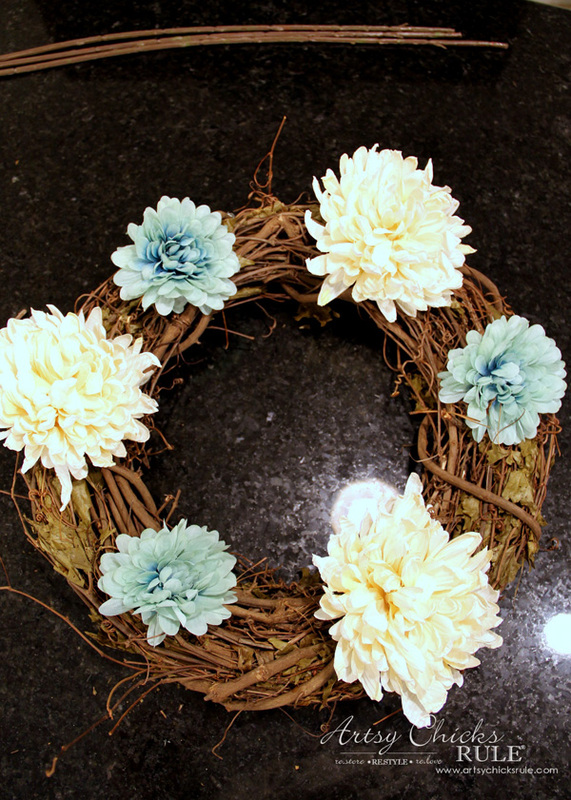 Click here to see how to make this wreath with more traditional colors! hey girl love the wreath! So cool! My husband and I painted our front door a couple of weeks ago. 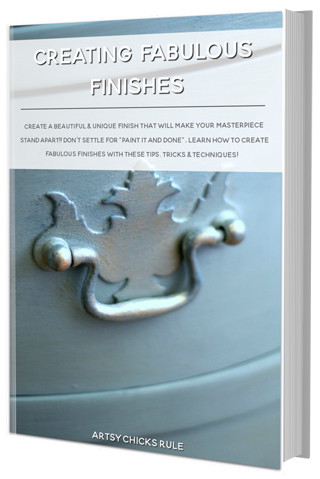 It’s called mystified by Valspar it’s a blue color and we really like it! good luck. Ohh…I just looked it up, it’s very pretty!! Thanks!! 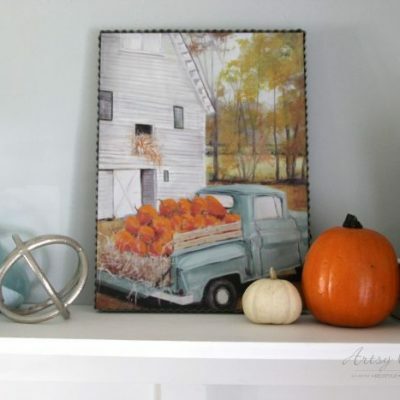 Love the teals being used in Autumn decor. Last year was my first time and did it to show support for Food Allergy, for my granddaughter. Going to be even more used this year. 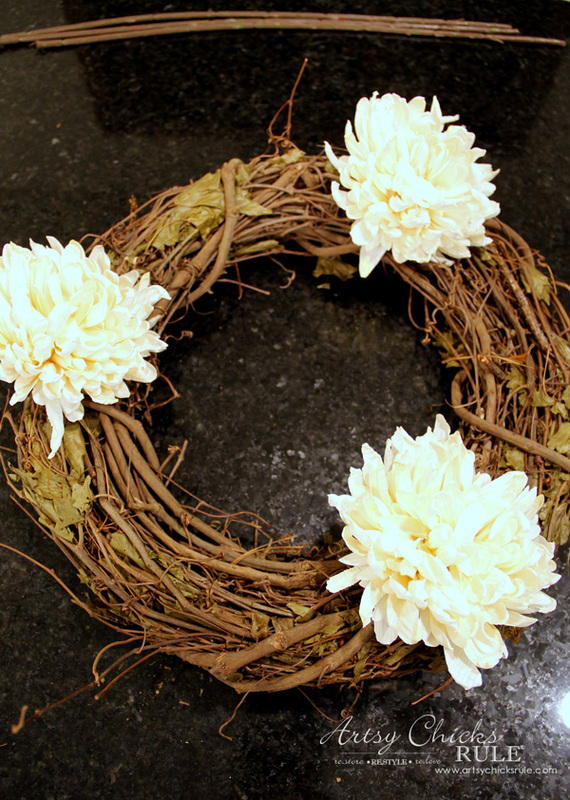 I love the way you put your wreath together and that you showed us how step by step. The colors look great together. I use those colors in my living room. Thanks for another little bit of inspiration! Love those colors! I too use blues & greens and don’t care for oranges. I like how you infused with the copper accents. I’ll be making a trip to Michaels this weekend. Thanks for all the great ideas! 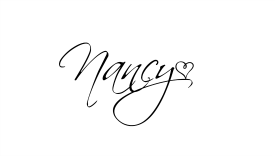 Very nice, Nancy ! 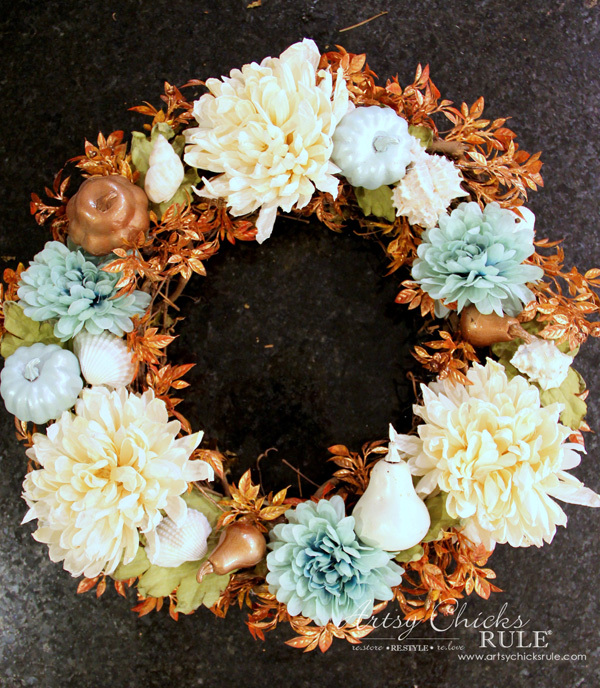 Love how you used florals and seashells that are not what you associate with Autumn but when paired with copper, pumpkins, and gourds, make a beautiful Fall Wreath. So pretty! Love that shade of blue with copper. Just bought a copper ink pad to stamp acorns on my fall card envelopes. thanks! I love the wreath!!! 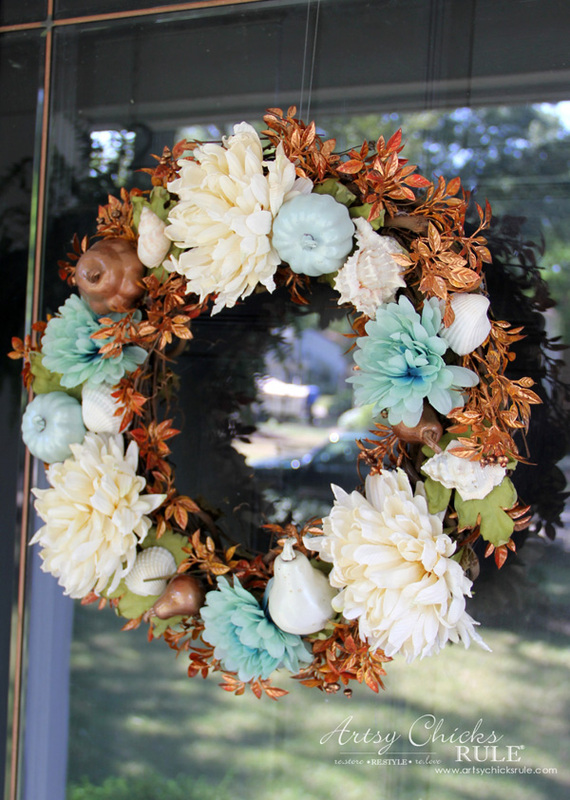 I’m usually a traditional orange/brown fall person, but I love the blue in the wreath!! Even though I don’t have any coastal decorations, I do have a lot of blue touches throughout my house. Love the wreath!! Hi Crystal! :) Thanks!! Oh this would go great with your decor then! Thanks for the lovely inspiration, I recently changed to shades of Aqua also, plus kind of a light coral melon color in my kitchen. The Aqua works so well with many colors. 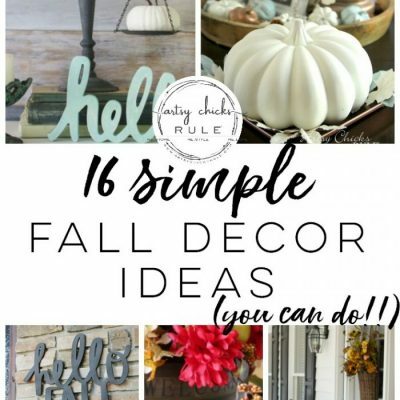 Will have to try something on this order for my Fall Front Door. You are so welcome! Oh yes, I especially love aqua with coral. Pretty!! This is gorgeous. I need to go to Michaels now! Can you give us an estimate of what it cost to make this please? Thanks for sharing. Thank you! :) Yes, you do!! 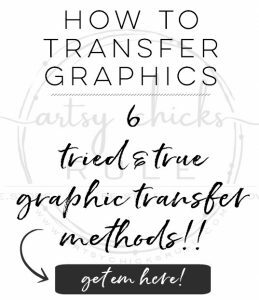 ;) I sure can, and will edit the post to include that info. I spent $20.62 for everything you see, except the small pumpkins and shells. I already had those. Still, much cheaper than buying a ready made one! 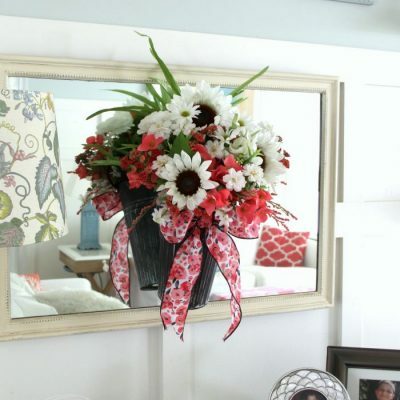 And you can customize it to your decor/liking. 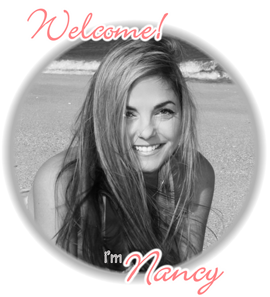 Love it Nancy, coastal decor is my favorite!